"exploring the northeast's most extreme backcountry skiing at tuckerman ravine"
Intrepid Descent captures the classic backcountry skiing experience of Tuckerman Ravine on Mount Washington in New Hampshire. The documentary explores the rich history of the ravine, which has been home to triumph and tragedy since the early 1920's. A present day narrative takes viewers from the daunting hike and climb up the Ravine to the exhilarating descent over the lip, while interviews with experts, meteorologists, and rare historical footage provide a broad and dynamic view of Tuckerman's. 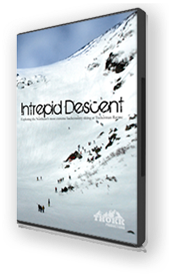 A classic man-versus-nature story, Intrepid Descent pays homage both to the mountain and to the individuals who dare to pursue their passions.